Hi there everyone!!! 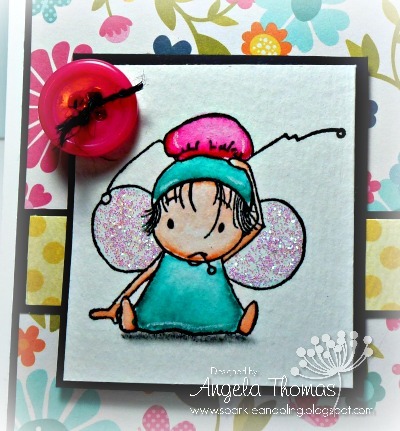 It's our last Bellarific Friday challenge at Stamping Bella for the year. WOW!! Where did this year go? This week's challenge is "Thinking about You". Cathabella is feeling under the weather so I decided to use one of my favorite Huggabuggs called "Fluey Huggabugg". The image was stamped in Versafine Onyx Black, embossed with clear embossing powder and then watercolored with Tombow Markers. The layout for my card is last week's Freshly Made Sketch. 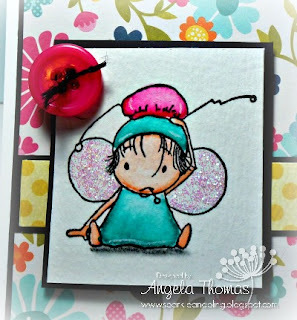 I added some Crystal Stickles to this cutie pies' wings for a bit of extra dimension. I also added a button.... it covers up a booboo. Oops!!! No sooner did I finish the image and the pink marker rolled onto my page. Yikes!!! Thanks for popping by!! I'll be back over the holidays with some more fun stampy goodness. So beautiful Angela! Love taht glitter and button! Very sweet! Sure to cheer anyone up with the happy, bright colors!